It is mere hours before the NFL draft. Bo Callahan (Josh Pence), a promising young quarterback, is everyone’s top pick. Tom Michaels (Patrick St. Esprit) and Walt Gordon (Chi McBride) of the Seattle Seahawks are looking for the most desperate general manager in the league they can find to get them to overpay for the first pick. Naturally, they reach out to the Cleveland Browns. Browns GM Sonny Weaver Jr. (Kevin Costner) has his sights set on Vontae Mack (Chadwick Boseman). Anthony Molina (Frank Langella), hoping to turn his losing team around, has other ideas. After learning that Sonny made a deal with the Seahawks, Molina is set on Sonny choosing Callahan. Any other choice and Sonny will be looking for a GM position elsewhere. The Browns coaching staff , especially Coach Penn (Denis Leary), agree with Molina. If the stress of the draft wasn’t enough, Sonny is dealing with changes in his relationship with his girlfriend, Ali (Jennifer Garner), and a strained relationship with his mother (Ellen Burstyn). On top of all that, Sonny’s regular intern is out of the office on draft day, being replaced by Rick (Griffin Newman), an inept intern, who isn’t quite ready for prime time. Sonny’s priority has always been to do what’s best for the team. If that means replacing his ailing quarterback Brian Drew (Tom Welling) with Callahan, then that is the path he will take. But is that the best decision for the team? 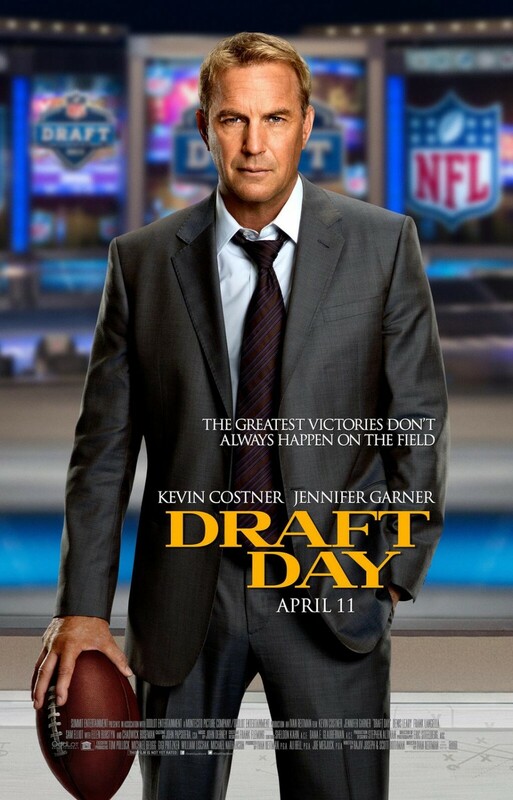 Draft Day, timed perfectly to get you pumped for the actual NFL draft in May, is not your typical sports movie. There is no actual sports action in the movie. At all. Don’t expect a classic like Rudy or Slapshot. You will get nothing of that nature. Instead, it is more like Moneyball, without the prospects of award nominations. What you will get is a tense, behind the scenes movie that is rather entertaining. At first, I found the circumstances between Sonny and Ali to be a bit of a busy distraction. Add in to that, the tension with his mother, and you may start wondering what this has to do with the plot. What these side stories do is show you that Sonny has to deal with the same problems everyday people have to deal with, all while managing high-profile stresses that come with being an NFL general manager. It worked better than I expected. It is nice to see Kevin Costner getting away from the 3 hour epics he seemed to do exclusively for many years. He shows that he can pull off a lighter, more mainstream movie with ease. He pulls off a Sonny who is torn both personally and professionally. Jennifer Garner’s character is much more balanced. She is a woman who has dedicated her life to football. If you’re wondering if she can pull off a character like this, rest assured. It doesn’t come across as forced or overworked. Growing up watching Denis Leary, it is a little difficult for me to see him pull off more serious roles. He manages to do a decent job here. Instead, they employ Griffin Newman to play the foil to Costner’s Sonny. Most of the laughs in the movie come from his character. He pulls it off rather well. I have never had any interest in the NFL draft at any level, yet, somehow, Draft Day made me care. At least, in regards to the movie. Regardless of the outcome of the movie, I wouldn’t count on a dream team coming out of Cleveland next season. Remember, it’s only a movie.